Zong brings nother exciting offer under the name New SIM Offer. 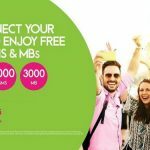 Now Zong Customers can get 2000 MB Free for 3 days on every recharge of Rs 100 or above. 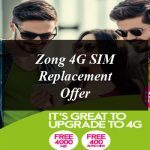 How To Avail Zong New SIM Offer? To avail this offer simply dial *10# once after activating SIM. Zong New SIM Offer is applicable for the new prepaid customers. Offer Starts from 18th April and will remain till 31st May 2017. Zong has all the rights reserved to change the offer anytime.